One of the things I love about Friday is when Andrew brings home our share of goodies from The Good Food Collective. This Friday I had the pleasure of going myself to pick up our fruits and veggies. Chris and Chad, two of the guys behind the GFC, always have good ideas on how to cook the veggies and their ideas often inspire me to create new pizzas. As I placed fresh dill into my reusable shopping bag I commented that it might be fun to add dill to my dough recipe. The guys thought that would be a great idea and Chad suggested that I add salmon. Andrew and I enjoy salmon, but I have not yet used it on a pizza. Needless to say, I was super excited to get home and try this out! When I got home I rinsed and then chopped up the fresh dill. Then I minced some onion. I made my normal dough recipe, then added the dill and onion. While that was rising I prepared the other ingredients. My mom has been experimenting with making smoked salmon and she was nice enough to donate some fresh smoked salmon for the good of the pizza. I broke the salmon by hand into small bite sized pieces. For a base, I roasted garlic and mashed it with olive oil, then spread it on the pre-baked dough. I sprinkled on mozzarella cheese, the salmon and added some capers before letting it finish bake in the oven. The dill and onion made the crust taste great, fresh and summery! 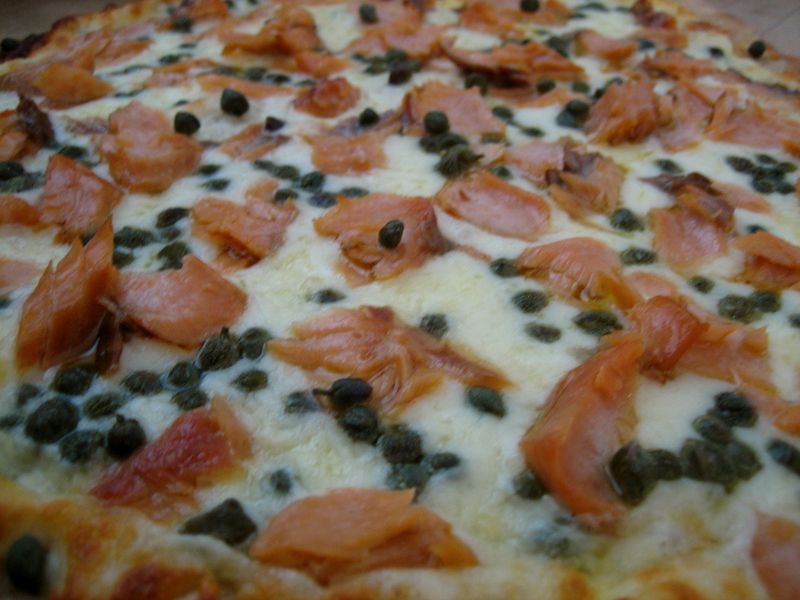 I love smoked salmon and on this pizza it tasted amazing. All of that along with the capers made this pizza a success! In making this pizza I became inspired to experiment more when making my dough and encouraged to use seafood on more pizzas. This entry was posted in capers, cheese, dill, Fruit, garlic, herbs, mozzarella, salmon, Seafood and tagged capers, mozzarella cheese, pizza, roasted garlic, smoked salmon, The Good Food Collective. Bookmark the permalink.